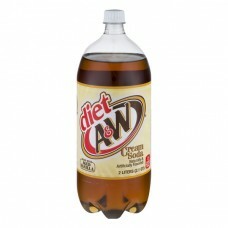 Diet A&W® Cream Soda. Made with aged vanilla. Naturally & artificially flavored. 0 calories per 12 fl oz serving. Bottled by an affiliate of The American Bottling Company, 5301 Legacy Drive, Plano, TX 75024. With caffeine. Caffeine content: 22mg/12 fl oz. Consumer comments? 1-866-AW ROOT BEER. rootbeer.com. ©2011 A&W Concentrate Company.